A great day of tasting at Betz Family Winery in Woodinville. 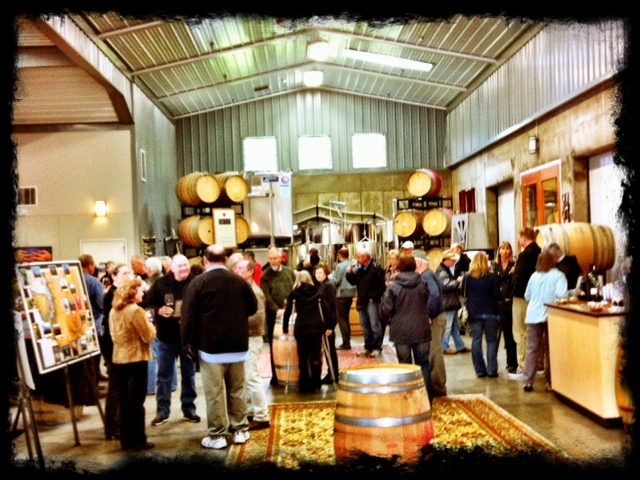 What a weekend for the Betz Family Winery Spring Release 2014! After taking a hiatus for the past couple of releases (due to busy schedules), we were able to volunteer again for this spring release in Woodinville. It was great to see all of the volunteers we’ve come to know over the past several years, as well as Bob and Cathy Betz, and managing owners Steve and Bridgit Griessel. (Bob says this might be his best CDB so far)! Here’s the description from BFW: Our first Merlot grapes ripened nearly two weeks later than average this vintage, and the longer hang time benefited Merlot’s intrinsic rich fruitiness. As the traditional foundation of Clos de Betz (67% this bottling), Merlot always provides its substance and texture, and with the additional hang time, these are highlighted in 2011. The delayed ripening led to a supple mouth-feel, characterful aromas and fine depth of flavor. 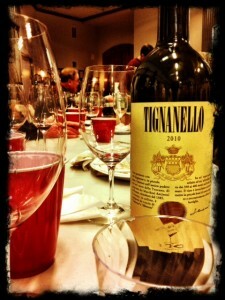 Ripe black cherry, mocha and wood spice are the hallmarks of this wine and are reflected in the wine. The additional dimension of this vintage is its age-ability. It reminds us of the Clos de Betz from 1999, another cool vintage, which at 12 years old is drinking beautifully. Both the 1999 and 2011 are reminiscent of a well-crafted, top flight St. Emilion. This 2011, with the addition of Cabernet Sauvignon and Petit Verdot, certainly has the vitality and structure to go the distance. During future cellaring, look for emerging aromas of cherry, dark plum and cocoa powder, while the palate softens to a harmonious, creamy texture. It’s 67% Merlot, 28% Cabernet Sauvignon and 5% Petit Verdot, aged in 100% French oak barrels. Best served from 2016 through 2036 (yes, you read that right — 2036). Post-release dinner with ‘mystery’ wines. Talk about hang time: we harvested 100% of our Cabernet Sauvignon this vintage after October 10, most of it in the final days of the month. This is a record for us and reflects the cool start to the season. Those lazy days of slow ripening led to an intensity of flavor and completeness of Cabernet’s penetrating character. It retains the vitality of a cooler vintage, but with the black currant, plum and black cherry of fully developed Cabernet. Part of that is due to the highest concentration yet of Cabernet Sauvignon in the Pere de Famille, 88%. Merlot and Petit Verdot play minor roles, so this wine is unapologetically Cabernet. The essential Cabernet fruit is enhanced by floral, rocky notes, dried thyme and anise, spice box, and vanilla oak aromas. It’s sturdy wine, tenacious and promising of long cellar potential, but opens with creamy integration to an elegant, long finish. It’s a blend of 88% Cabernet Sauvignon, 9% Petit Verdot and 3% Merlot, again, aged in 100% French oak barrels. Best served from 2016 through 2036. If you attended the release party on Sunday, you might have seen me greeting you at the door, or packing up your order. It’s always great to see Betz customers, as this is one of the few times of the year when people are invited in at the winery. For us volunteers, one of the things I enjoy most is our post-release dinner. This year, Steve brought in several ‘mystery’ wines. We are required to taste, and then guess New World or Old World, region, varietal, year, and sometimes even price point. There’s a lot of wine talent around the room (excluding myself), and I learn a great deal from the others who have amazing palates and wine experience. 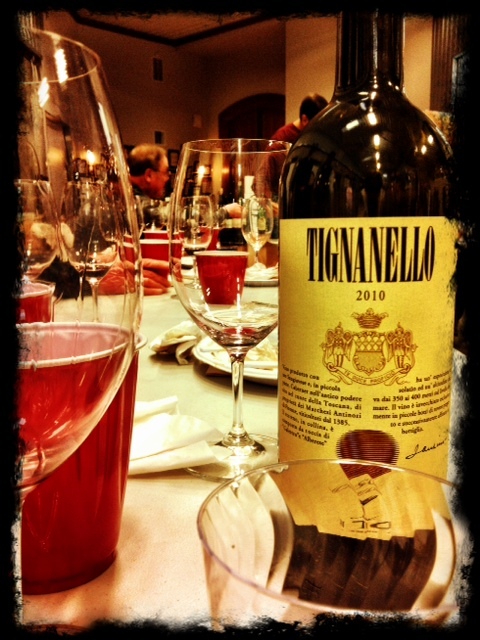 The Tignanello (seen above) was one of this year’s standouts. Thanks for another fun Spring Release!